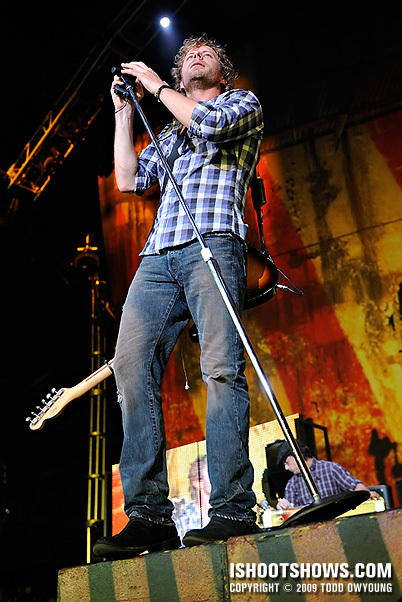 June 18, 2009 – Opening up for Brad Paisley, Dierks Bentley defied the 100º+ heat index to deliver an aerobic set that saw the country singer bounding over the length of the stage and making ample use of the tour's three ramps. The rules for this set were the second and third songs, which was a good thing, since Dierks spent most of the first song running around every square inch of the stage and the three ramps. Of course, he only turned it down a notch during the second and third songs. This near-constant movement kept the press on our toes, and there were still plenty of opportunities to photograph the country singer from a stationary spot at the front of the stage. The setup for the evening included two ramps/catwalks out into the crowd from the stage: one center and two on the sides. The middle ramp terminated in a small round satellite stage, which Dierks went out to on occasion, but he mostly rocked the two side ramps. The 8:10 set time for Dierks Bentley still left a little daylight hanging in the air, which provided a diffuse fill light to the stage. Spotlights with a magenta gel were trained on Dierks for the first three songs, and their intensity kept shutter speeds up and ISO down. There was no dedicated photo pit for this concert, so photographers simply hung out at the front of the stage near the center catwalk. 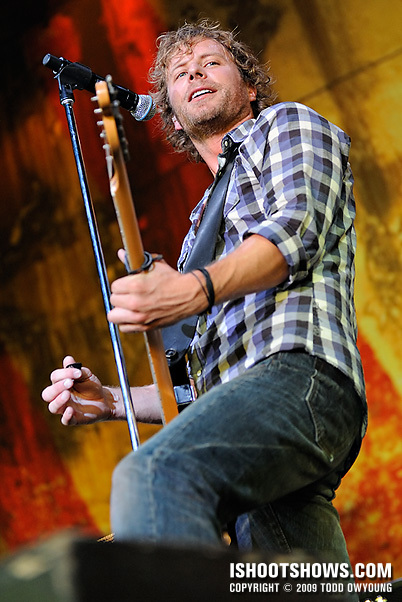 Dierks moves around so much that I think the left and right sides are pretty equal as far as angles and photo opportunities. For right-handed guitarists, I generally take house-right for my own compositional preferences, so that's where I choose to shoot from for this performance. 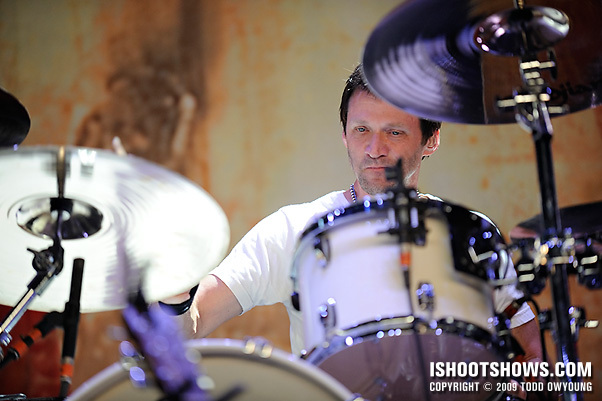 The Nikon 24-70mm f/2.8 and Nikon 70-200mm f/2.8 easily took care of this gig. 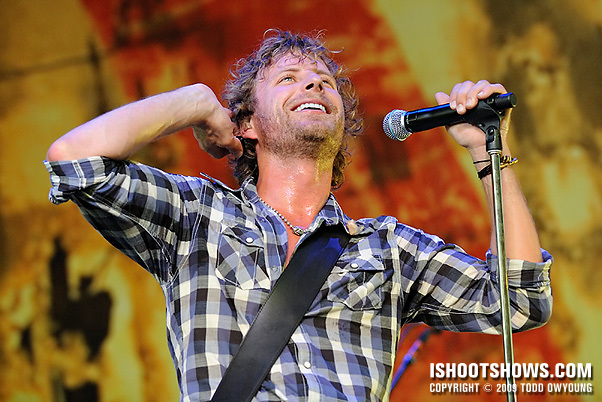 After reading your commentary on the conditions, I give the you and Dierks Bentley props for still being able to function in the 100+ degrees weather. 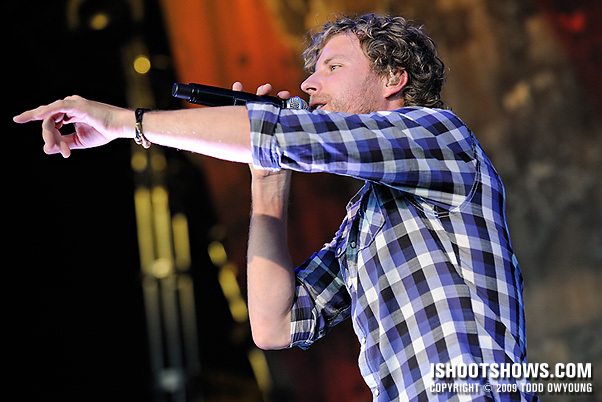 You’ve captured some great energetic shots of the singer. Also, I hear you are a WashU alum. Have you visited since construction started happening? 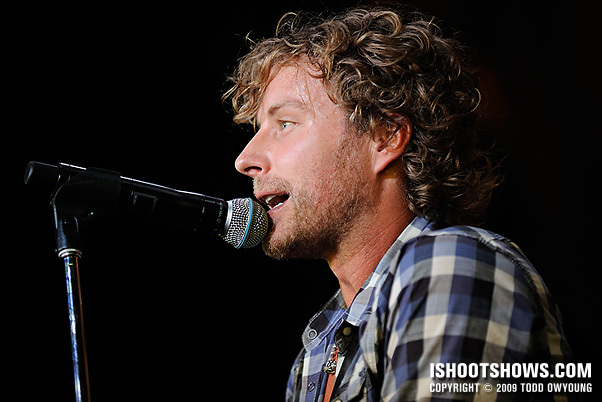 Dierks seemed just fine, though I was sweating it out – and I was only shooting three songs! I have to give these performers respect for putting on such energetic performances in this weather. I haven’t really walked around campus, though I did see the new student center on the main campus, which looks great. It puts old Mallinckrodt to shame. Are you connected with Washu, too? I’m a current student at WashU. The DUC certainly is very interesting. There’s a room on the upper floors that has black boards for walls. I wouldn’t say that much has changed on the main campus besides the construction of a new engineering building, but the South 40 is currently being revamped. Yeah, it seems like they’re always building on campus – soon, there isn’t going to be any green space left! I haven’t really been to the South 40 recently, but I can imagine that they’re replacing all the old dorms. It is my understanding that after they finish construction on Umrath, they’re going to be tearing down Ruby. Then the only two traditional freshman dorms left will be Lee and Beau. There is also ongoing construction for a New Wohl Center which will feature a new Bear’s Den and Center Court and maybe replace Ursa’s. The plans keeping changing because of budget cuts. 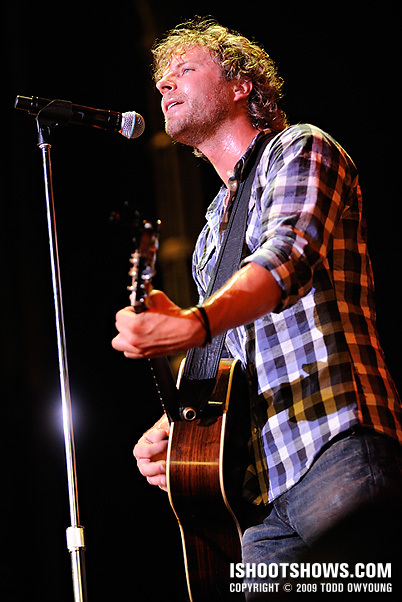 Just wanted to tell you that I am a huge fan of Dierks Bentley and these are just terrific shots of him. I’m always in the pit (if there is one) and he’s tough to shoot. If not the lighting, then the speed at which he moves. Lovely, lovely photos. Thanks so much for posting. 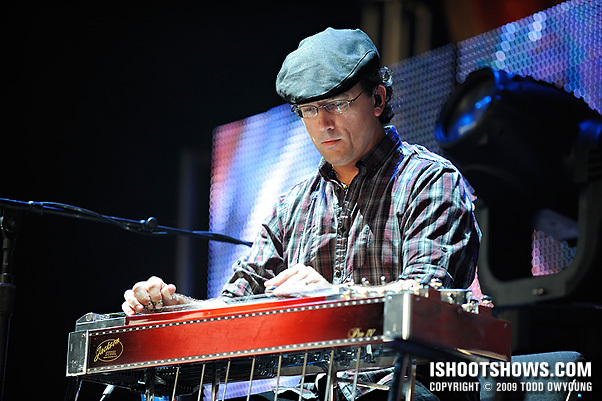 You’ve captured him in motion, in song, at his best! Thanks for taking the time to comment, I love hearing from fans. 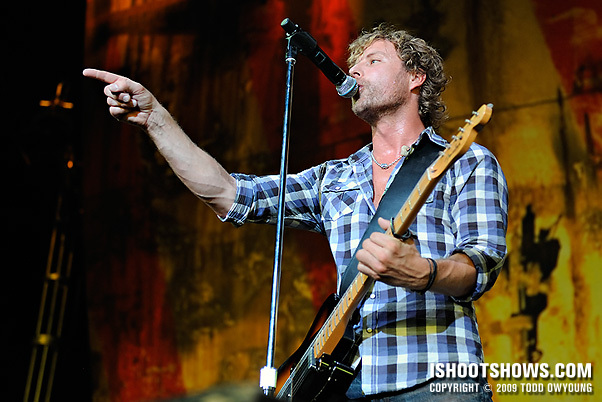 I’m glad to hear that these shots capture Dierks for you – that’s always my goal when I photograph a concert. 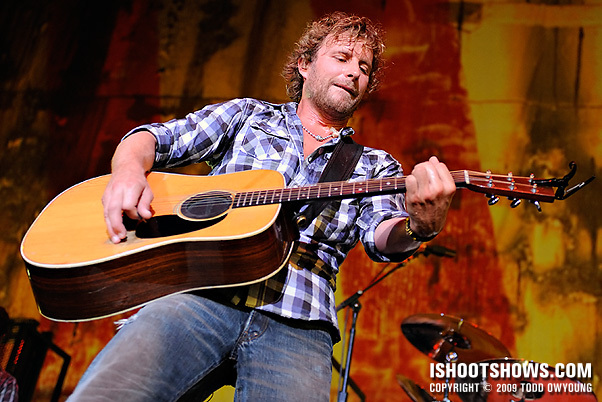 thanks for the great pictures of DIERKS and HIS BAND!!!! 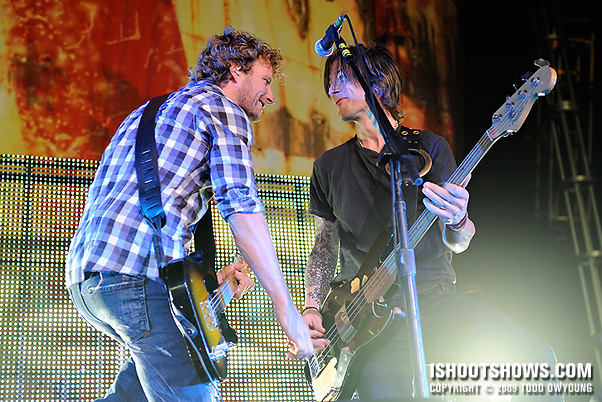 his band is such an important piece of what he does……they’re awesome!!! Thanks for the comment. Glad to hear you enjoy the shot. I wish I had more shots of the band! 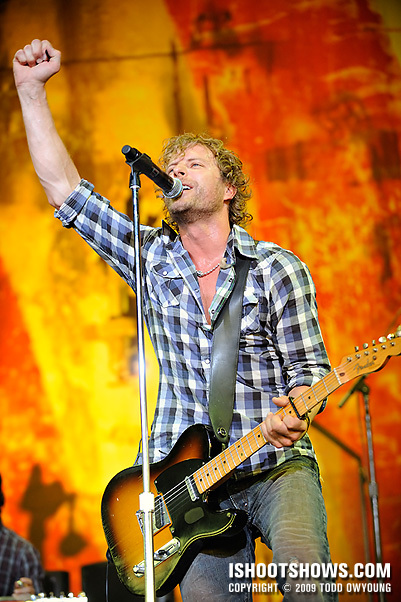 Any chance you will be shooting the Jagermeister Country Tour he is headlining at the Family Arena? And do you sell any of your prints?